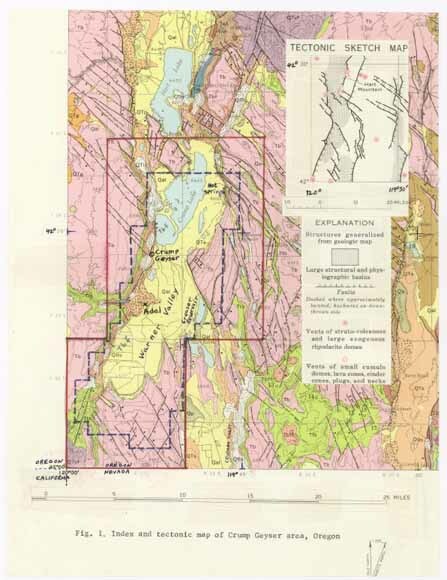 Plouff, Donald, 2006, Geophysical studies of the Crump Geyser known geothermal resource area, Oregon, in 1975: Open-File Report 2006-1110, Geological Survey (U.S.), Menlo Park, California. Horizontal positions are specified in geographic coordinates, that is, latitude and longitude. Latitude and longitude values are specified in decimal degrees. The horizontal datum used is North American Datum of 1927. Table 2. Location description code (digit one). B  45 On level-line benchmark incorporated into U.S. Geological Survey vertical control system. P 188 Location of surveyed elevation. X   5 Near location markers such as section corners. D   1 Near assumed location of any of the above markers that were destroyed or not found. R   1 Lake or reservoir elevation determined from leveling to benchmark. F  32 Near a location with or without a marker at which a surveyed elevation is indicated on a published topographic map. G  58 Near a location (on a manuscript map or a published map) at which spot elevations are determined by photogrammetry or near a doubtful F-location. W  12 Near edge of lake or canal; interpolated elevation or elevation given for water at unknown height relative to present level. Table 3. Accuracy of elevations (digit two). [The number after the numerical code indicates the total number of stations for which the code was used. Note that uncertainty of horizontal location tends to reduce the elevation accuracy]. Table 4. Accuracy of horizontal location (digit three). Table 5. Accuracy of observed gravity (digit four). Geophysical information republished in improved formats because the information was otherwise difficult to obtain. Original study was conducted in support of the resource appraisal of the Crump Geyser Known Geothermal Resource Area (KGRA). This area was designated as a KGRA by the USGS, and this designation became effective on December 24, 1970 (Godwin, and others, 1971). The land classification standards for a KGRA were established by the Geothermal Steam Act of 1970 (Public Law 91-581). Federal lands so classified required competitive leasing for the development of geothermal resources. Plouff, Donald A., 19750617, Gravity data in Crump Geyser area, Oregon: NTIS PUBLICATION PB-245-426/AS, U.S. Geological Survey, Menlo Park, California.